For clothing I almost always go for Mountain Hardwear. Rugged, comfy, and always fits me well. A semi-local shop (Asheville, NC) that sells my favorite hammock gear. 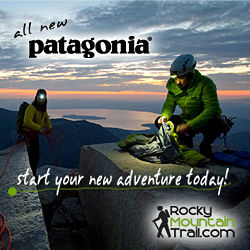 Backcountry has super deals year round. This is a HUGE online store plus they have the best logo. Mountain Goat wins. This is a smaller online store but you get a nice 12% discount on first purchases. I often visit here as sometimes they have deals that outdo some of the bigger retailers. REI is owned and operated by those that join the co-op. Great place and knowledgeable staff plus their on-line outlet is great for snagging deals. This is usually where I end up before hitting the trail. Moosejaw has the best sense of humor. The site is hilarious as are their catalogs. They enjoy what they do and have fun selling gear and clothing. I use Under Armor for my workouts and for my trips in the woods. Excellent and comfy stuff! If you don't know Under Armor then you're probably inactive or living under a rock. Want some comfy clothes for both outdoor and leisure wear? Then check out Icebreaker for some New Zealand Merino goodness.